Nuclear-powered icebreaker 50 Let Pobedy reached the North Pole on August 16, 2015. According to Rosatomflot, it is the hundredth arrival of Russia’s surface ships to the Pole. 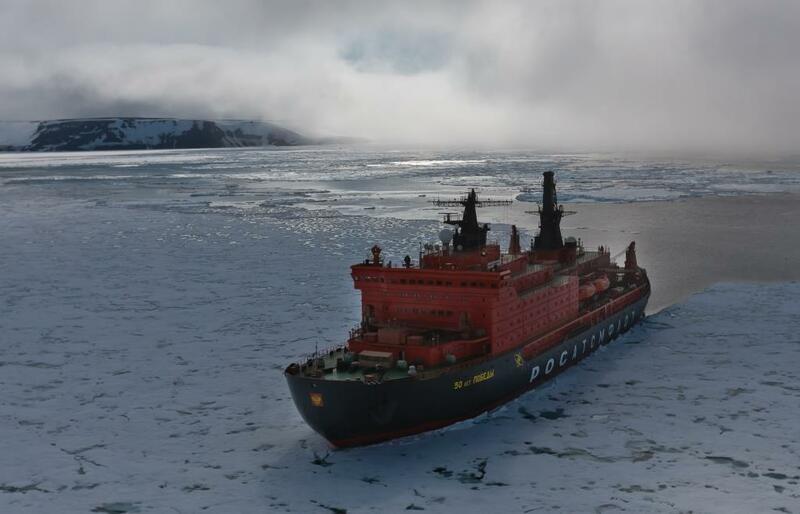 “It is notable that the arrival took place a day before August 17 – it was on that day in 1977 when nuclear icebreaker Arctic became the first surface ship to reach the North Pole,” the statement says. This season’s seventh voyage of the icebreaker started in Murmansk on August 11. It lasted for 99 hours. The icebreaker which has now left for Murmansk is expected there on August 22. On their way the tourists will visit the islands of the Frantz Josef Land Archipelago. “As for the statistics on the North Pole visits, surface ships were there 118 times including 100 visits by ships flying the flag of USSR and Russia, 8 times – Sweden, 4 times – Germany, 3 times – Canada and the USA each. 95 of Soviet and Russian visits were made by nuclear-powered icebreakers, research vessel Akademik Fedorov was there 4 times, diesel icebreaker Kapitan Dranitsin – 1 time. The record-breaker among the nuclear-powered icebreakers is the Yamal which visited the North Pole 48 times including 23 times with Aleksandr Lembrik as her Captain. Apart from multiple tourist voyages, nuclear icebreakers visited the Pole under the special project of the Sochi 2014 Olympic Torch Relay. From 2008, tourist voyages to the North Pole are carried out by the nuclear-powered icebreaker 50 Let Pobedy - 33 times. Upon completion of the current voyage cruise season 2015 will be over and the icebreaker will resume her routine operation – escorting of vessels in the Northern Sea Route.